Dinah Hubley didn’t have much of a childhood. Her mother is a prostitute and she grew up in popular Chicago brothel. Her dream is to become one of Harvey’s girls–a well-respected hotel waitress. When a tragedy occurs and her mother dies, Dinah tries to move on from her painful past and becomes a chambermaid at the Clifton Hotel. Amos Ackerman is a chicken farmer who has been the subject of ridicule his entire whole life due to an old injury that gives him a limp. He immediately takes a liking to Dinah–but will they be able to move from their pasts to embrace a beautiful future? I have kept up with all of Kim Vogel Sawyer’s latest releases ever since reading My Heart Remembers, one of my favorite books. I immediately snatched the chance to read Through the Deep Waters when it came out. As much as I love the author and really wanted to love this book, I thought that it was just ok. Although the premise of the story was interesting and the message was beautiful, I didn’t connect with any of the characters and found myself bored and reading it quickly just so I could finish. However, this book did have a good message. It shows that no matter what you have done in your life or how broken you are, you can find peace and healing through Christ. I thought it had a nice ending as well. 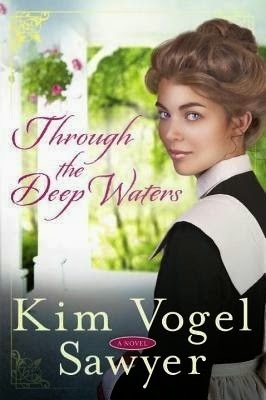 To sum up, Through the Deep Waters had a touching story, sweet romance, and a powerful message. Unfortunately it didn’t quite hold my attention. If you enjoy uplifting historical novels, then I recommend you try out this book. **I received this book for free from Blogging for Books for this review.